The heart and soul of “Mystic Wood” is self-taught artist Alex Ferri. He was born into a family where creativity was not only encouraged: it was a way of life and a means of making a living. While his parents worked in a variety of artforms, Alex would find his own unique expression in wood (and, later, also in tagua nut, antler, and bone). At the age of twelve, and on his own initiative, he bought his first scrollsaw. He soon recognized its limitations, and in the following five years he upgraded twice, already understanding the importance of good tools. It did not take long for him to see that simple scrollsaw work could be significantly enhanced by combining it with carving, especially as his interests turned to the symbols of old European culture. He became passionate about rendering mystical designs mostly in fine domestic woods. The resulting pieces are as much amulets as pendants. Experimentation and experience were great teachers. As he honed his skills, he was further guided by family friend and master carver, Richard Bear. Over time this training led to soulful and inspired works of art. 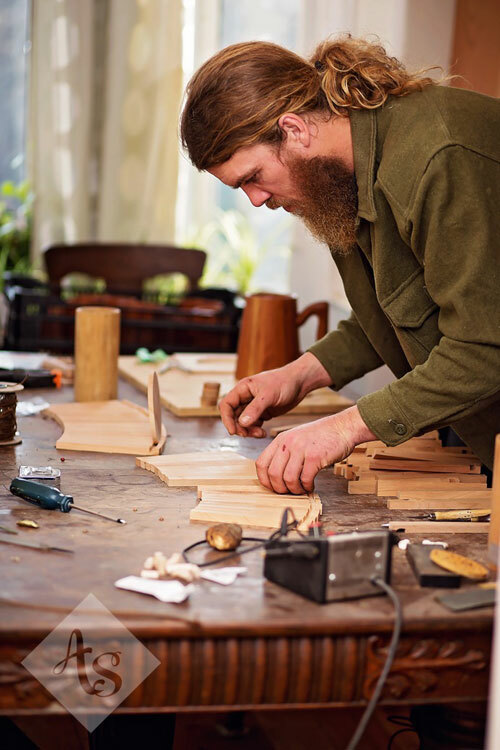 In addition to his carvings, Alex has developed his own intricate process to create usable wooden beer steins. Even the personalized woodburned designs and logos are up to the same standard of excellence as the rest of his work. For several years Alex sold his creations primarily at folk festivals. While this life satisfied his creative side, financial realities forced him to find regular gainful employment. Not surprisingly, he found it with a tree service, where he stayed for five years. He developed an entirely different set of skills during that time, and learned a great deal. He also learned that this did not fulfill his soul. The minimal carving he was doing on the side made him realize that his work was increasingly valued and sought after. Losses within the family also nudged him to reflect on his priorities. As a result he chose in 2015 to turn his life's focus primarily to his artwork, and looks forward to greater unfolding of his natural talents.